Across the street from our old office was a local Japanese restaurant that served yummy Curry Omuraisu. A large omelette stuffed with chicken curry rice, I loved how each bite was full of meaty curry goodness. It’s been months since I last had it though since we moved offices, so when I realized we still had leftover Japanese curry, I decided to give it a go. My version of curry omuraisu was simple enough. I simply went through the motions of making fried rice, only, I added dollops of leftover curry sauce to it. I would’ve loved to use actual curry, but I finished all the pork and veggies the night before so I had to settle for curry sauce. Still, I figured it would be all right if I’d have a side of meat and veggies with it. 1. Beat two eggs. Add salt and pepper to taste. 2. On a wide, non-stick pan, add oil. When hot, pour your beaten eggs, making sure to spread the egg thin and wide. 3. When one side is done, flip. When cooked, slide unto a plate. 4. Add your rice to the slightly greased pan. Saute to heat evenly. 5. Add as much sauce as you desire. The texture you want is slightly wet and sticky, but not dripping with liquid. Continue sautÃ©ing. 6. Spoon your rice on your thin omelette, keeping them together in a long cylinder. 7. 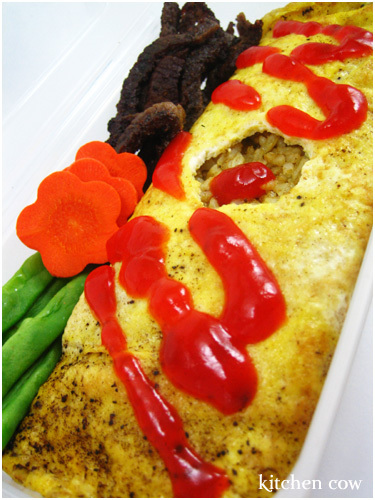 Using a spoon, spatula, or your hands and some cling wrap, fold the two ends of the omelette, wrapping the rice. 8. Serve upturned, with the flaps underneath. I saw someone cook Omuraisu on a J-drama once (I think Kimura Takuya’s Hero) and the cook was so good. She actually managed to do the wrap thing simply by tapping the frying pan! She did little taps to the pan handle and sure enough, the omuraisu would flip over little by little, encasing the rice. I don’t think I can manage to do that, hence this mock preparation, but as long as we get to eat afterwards, it’s all right, I guess? To go with it, I did an experimental salt and pepper beef stir-fry. Very easy to do so it’s perfect for the morning rush. For my veggie component, I steamed some carrots and green beans in a microwave steamer—the kind you buy for 88 Pesos at Japan Home Center. Very useful for quick bento prep. A full meal in 20 minutes or so and a cure for Curry Omuraisu cravings. Not as satisfying as that resto’s, but for a quick fix, it sure hits the spot. 1. Cut the steak into strips. 2. Sprinkle with some salt and lots of crushed pepper. 3. Stir-fry in butter until brown and slightly crisp on the sides. I must make this again! Also, I just wanna give a shout that I discovered a Japanese grocery at Greenhills, beside UCC. They sell the usual stuff, and not-so-usual stuff including ramune! You didn’t mention how wonderful the food starts to smell once you mix the curry sauce with the rice. I really had to restrain myself from eating everything right then! Thanks Sunya! I agree with you too, there’s something about the heady smell of curry cooking in the kitchen that leaves me drooling with anticipation. I don’t really worry about the egg spoiling as it’s fried. Plus, since we’re in a tropical country, the heat here is awful so I imagine food spoils here easier. I’ve never had a bento go bad on me yet so I guess as long as you avoid anything that spoils quickly and keep contaminants away, you’d be safe.